Air ItalyAn Air Italy Airbus A330-200 arrived in New York. Air Italy launched its New York-Milan, Italy route last week. Qatar Airways acquired 49% of Italy’s second largest airline in 2017. New York-Milan is the only place where American, Delta, United, Emirates, Etihad, and Qatar Airways compete on the same route. 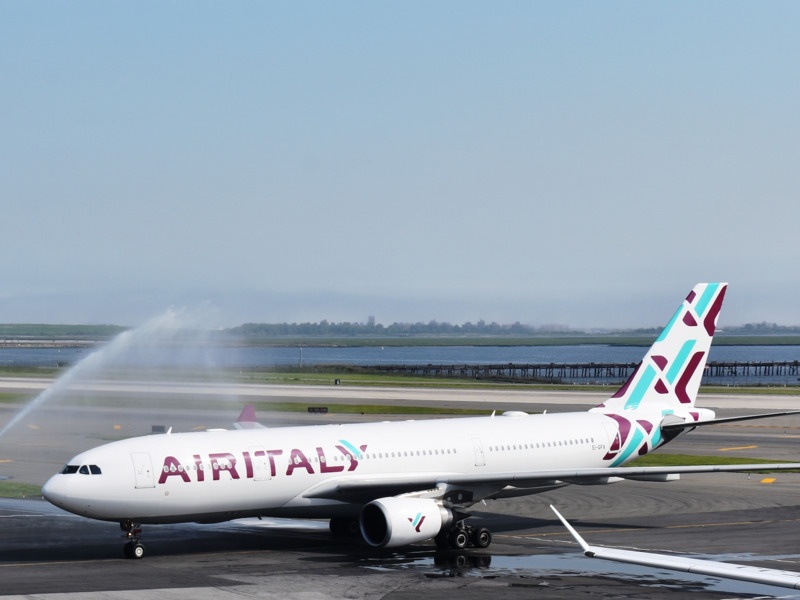 Air Italy landed in New York last week to great fanfare and an obligatory water cannon salute. But Air Italy’s new service between Milan’s Malpensa Airport and New York’s JFK International is much more significant than just the arrival of Italy’s second largest airline in the US. With the arrival of Air Italy, the airways connecting New York and Milan perfectly encapsulate the complexities of what is generally considered the nastiest feud in the airline industry. That’s because, for the first time I can remember, all six parties – American, Delta, United, Emirates, Etihad, and Qatar Airways – are competing on a single route. The three major US airlines have for years accused their three Middle Eastern rivals of gaining an unfair advantage by using $US50 billion in government subsidies to bankroll their expansion. The Middle Eastern carriers all deny the existence of subsidies. American, Delta, and United have all traditionally offered non-stop service between the Big Apple and Italy’s fashion capital. But then Emirates arrived in 2013 when it decided to launch service between New York and Dubai with a stop in Milan. The Emirates Milan flight has been highly controversial as it threatens the US carrier’s lucrative trans-Atlantic business. Neither Etihad nor Qatar Airways offer non-stop New York-Milan flights. But that’s where Alitalia and Air Italy come into the picture. Abu Dhabi-based Etihad competes through its 49% equity stake in Alitalia, which does fly between New York and Milan. Oddly enough, through a joint venture agreement, Alitalia and Delta share many of the flights. Etihad gained control of Alitalia in 2014 and proceeded to dump cash into the airline in an attempt to restore it to profitability. However, that effort proved to be highly unsuccessful with Alitalia going bankrupt in May 2017. The failure of Alitalia and the liquidation of Air Berlin led Etihad to reported a nearly $US2 billion loss last year. With Alitalia and Etihad in a weakened state, Qatar Airways jumped into Italian market by acquiring 49% of Sardinia-based Meridiana in October 2017. In February, Qatar Airways rebranded Meridiana and it became Air Italy. Both Airbus A330-200s that will be used for US flights are ex-Qatar Airways planes. While Air Italy’s newly Boeing 737MAX jets are leased by Qatar Airways and then sub-leased to Italian carrier. The parties agreed to provide a greater level of financial transparency while also keeping in place the OpenSkies air transport agreement that governs air travels between the countries. But this could be a temporary reprieve as the issue is scheduled to be revisited next year. With all six parties of the feud flying the same route, New York-Milan could serve as the ultimate battleground in airline industry’s nastiest feud.